Two DFL lawmakers announced Monday they've introduced legislation to get more teachers of color into Minnesota classrooms. "We have a significant problem recruiting and retaining teachers of color," said Sen. Patricia Torres Ray, DFL-Minneapolis. A report released by the Minnesota Professional Educator Licensing Standards Board and prepared by Wilder Research found only 4.3 percent of Minnesota teachers are people of color, while more than 33 percent of Minnesota students are people of color. State Rep. Mary Kunesh-Podein, DFL-New Brighton, said the legislation would provide incentives like scholarships and loan forgiveness to students of color who want to become teachers. The bill's sponsors said it would also help teachers of color with mentoring and professional development programs. The bill sets a goal of increasing the number of Minnesota teachers of color by 2 percent every year. "We know that when our educators reflect the diversity of our students, we will truly be much more successful in narrowing our persistent achievement and opportunity gaps that are among the worst in the country," Kunesh-Podein said. Assistant House Minority Leader Jon Koznick, R-Lakeville, also supports the bill. "I think this issue really is a bipartisan issue," Koznick said. "The nation-leading achievement gap is really an embarrassment and I think this bill goes a long ways to try to minimize and reduce the achievement gap in Minnesota." Racial disparities in achievement in Minnesota's education system are a persistent problem, despite funding increases during former DFL Gov. Mark Dayton's eight years in office. The Legislature passed a similar bill aimed in part at increasing support for teachers of color two years ago. 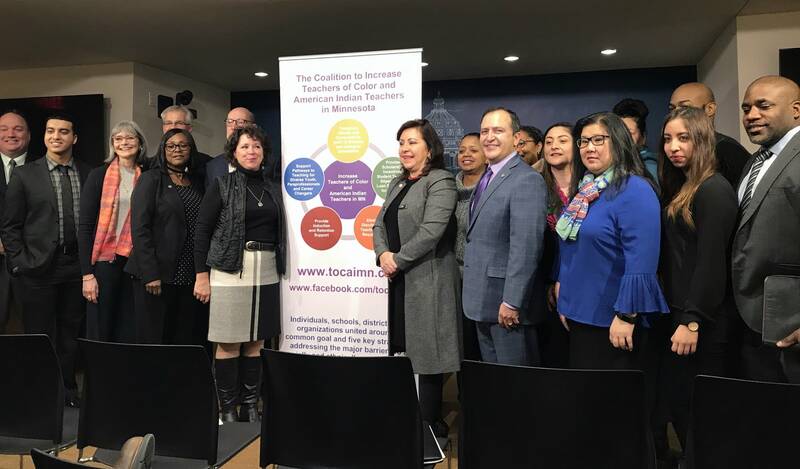 According to Paul Spies, the legislative action lead for the Coalition to Increase Teachers of Color and American Indian Teachers in Minnesota, that bill, along with other appropriations, spent roughly $6 million on recruiting and retaining teachers of color over two years. The bill announced on Monday puts close to $80 million toward recruiting and retaining teachers of color in the next biennium. "To us it's all about moving the needle at least 1 percent," Spies said. "The state has just given a little bit of appropriation to a relatively few programs that are relatively small, saying we're trying to do something. That's like giving crumbs to a starving kid."